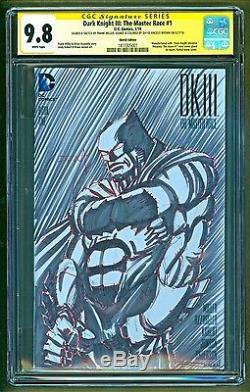 Batman Dark Knight 3 III #1 The Master Race SIGNED & Sketch Frank Miller CGC 9.8. Batman Dark Knight III #1. SIGNED and SKETCH Frank Miller. 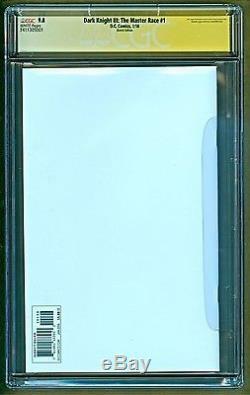 (CGC 9.8) WHITE PAGES. Written by Frank Miller and Brian Azzarello. Art and Cover by Andy Kubert and Klaus Janson. All Comics will come with bag and board, it will be packaged in a card board box. _gsrx_vers_625 GS 6.9.7 (625). The item "Batman Dark Knight 3 III #1 The Master Race SIGNED & Sketch Frank Miller CGC 9.8" is in sale since Wednesday, September 21, 2016. This item is in the category "Collectibles\Comics\Original Comic Art\Drawings, Sketches".